Part 1 of this article sought to provide a better understanding of the concept of substantial equivalence in premarket notifications, more commonly known as 510(k)’s, using easy-to-understand metaphors. We also looked at recently issued CDRH draft guidance concerning different technological characteristics of a 510(k) submission. In Part 2, we move on to another piece of recent CDRH guidance, this one dealing with the controversial topic of split predicates. Since this guidance was issued on July 28, it has generated a lot of discussion in the medical device industry — not all of it positive. The controversy centers on the guidance’s interpretation of split predicates. What is the split predicate strategy? Once again, let me use a metaphor that everybody can understand. Let's think of ketchup. If ketchup was a new medical device — there was no other ketchup on the market — how could we get it onto the market under the 510(k) using the split-predicate logic? One way would be to deconstruct the ketchup. In other words, what are the components we find within the ketchup? We find tomatoes; tomatoes are on the market. We find vinegar; vinegar is also on the market. We find sugar, which is on the market. We find a variety of spices that are already on the market. If each of these components of ketchup has been previously cleared, then the combination of those components in ketchup should also be cleared. This is how the split predicate strategy works. I’m dating myself here, but I was one of the first to successfully argue the split-predicate rationale at CDRH about 20 years ago. At the time, I was seeking clearance for a multifunction patient monitor. This was a single monitor, within one box, that could be used to measure blood pressure, respiratory rate, electrical activity of the heart, and a variety of other things. Of course, today such monitors are ubiquitous, but at the time, they did not exist. What we did was deconstruct the multifunction monitor into its constituent capabilities using the split predicate strategy. We said there are already blood pressure monitors, electrocardiograms (EKG), and other monitors on the market. If you add those together, you get this multifunction monitor. We were able to get the new monitor onto the market using the split-predicate strategy. Unfortunately, some companies have been permitted to bring products onto the market using the split-predicate strategy that, in hindsight, probably should not have been allowed. As a result, these products have caused problems and, in some cases, harm to patients. In response to these incidents, some folks at CDRH are now against the split-predicate strategy. Until recently, I have always advised companies to consider the split predicate strategy and to use it, if it makes sense. But I also told them to be aware — this is part of what I call regulatory risk — that the split predicate will be a red flag to some folks on the other side of the table, and that they were opening themselves up to the possibility of getting questioned further. This new guidance seeks to take matters a step further, proposing a ban on the split-predicate approach. In my opinion, that does not make sense. The split predicate strategy is a tool, and like any other tool, including medical devices, it can be very effective when used properly. When it's not used properly, of course, problems can develop. One interesting question to consider: How can you tell people not to do something within a guidance document that is itself nonbinding? In all of the debate that's going on around this guidance and the split predicate strategy — and all of it is important debate — I have not seen many people asking, “Is this even possible to do within the context of a guidance document?” Now, if a ban on split predicates were added to the Code of Federal Regulations or the Federal Register, that would be a different matter altogether. I truly hope that does not happen, because it would really hamstring the industry and prevent us from bringing a lot of important products onto the market. So what’s a device maker to do? Today, I still advise companies to consider the split-predict approach when it makes sense, but at the same time they should recognize that taking this route will have a greater regulatory risk than it did just a few months ago. I will make this same recommendation until the split-predicate approach is definitively prohibited and there is case law to support it — something I hope never happens! It's a balance. I understand FDA has a very important job to do. As I like to say, while a physician can kill patients one at a time, an FDA reviewer can kill patients thousands at a time. So we can't lose track of the importance of the job the FDA has to do. On the other hand, we also have to be aware that the more regulatory hoops that we create, the more difficult it is for companies to bring products onto the market. It’s one thing to measure how many people are harmed or killed because they use a medical device that is not safe enough, whatever that means. But how do we measure the number of people who will be harmed or killed because they don't have access to a particular medical device — because we made the regulatory burden so great that the device maker decides simply not to develop it? So it's a fine line. We want to have enough regulation to ensure that safe and effective medical devices get to market. On the other hand, we don’t want to have so much regulation that it stifles innovation. There is a definitely a fulcrum, a pivot point, in there somewhere. I have no idea where it should be, but this is a topic that is very important to us as an industry and, indeed, to all of us as a society, and we need more people talking about such issues. I’d like to talk for a moment about the multipredicate strategy, and how it differs from a split predicate. While these are similar terms, they're not exactly the same. Hopefully this will help you keep the two approaches straight. When you think of the split predicate strategy, think of the ketchup example we discussed previously. In short, this approach involves deconstructing your product into its individual components. When you think of the multipredicate strategy, think about the legs of a stool. The stability of the stool is a function of how many legs it has. If a stool only has one or two legs, it will be unstable. If you have three or four or five or seven legs, then the stability of the overall stool becomes greater and greater. To take the stool metaphor even one step further, it's not simply the number of legs under the stool that's important. It's the relative strength or the relative length of each one. In other words, you might have, say, seven legs under your stool. But if one of those legs is much longer or much shorter than all of the rest, once again, the stability of the entire stool becomes compromised. Bottom line: There is a lot more to designing a successful regulatory strategy than meets the eye! The 510(k) pathway is in a state of flux, and that’s a good thing! Regulatory science, if there is such a thing, should be an evolutionary science. Just like in design controls, where your outputs become your inputs in order to make better products and ultimately make the world a better place. However, you will be able to weather the storm if you put into practice the recommendation of Steven Covey, author of the bestselling book The Seven Habits of Highly Effective People: Begin with the end in mind. If you have a medical device that you hope to bring to market under the 510(k), before you start writing your submission — very early in your design process — begin with the end in mind. Figure out what it is exactly that you want to accomplish. One of the best places to start is with the label claims, with the intended use. 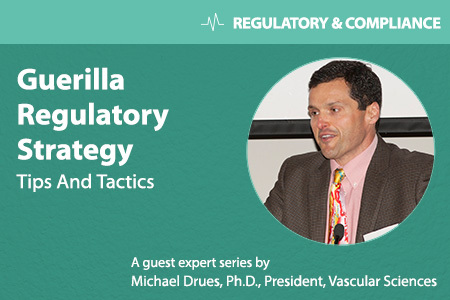 It will be a very effective strategy for you in developing your regulatory strategy. One other recommendation I would make is to think about your regulatory submission as a design process, rather than a writing process. There are a lot of folks out there that write regulatory submissions, whether they’re for a 510(k), a premarket approval (PMA), or other pathway. Instead, I would suggest you design your submission. Just like an engineer would sit down and design a medical device, you should design your regulatory submission. Lastly, consider the most radical approach: Forget FDA, forget regulatory requirements. If a family member, close friend, or perhaps even you were need of you medical device, what would you need to see in terms of safety, efficacy, performance, etc. to recommend it? That’s the ultimate test. If you pass that test, everything else should be a walk in the park! If you employ these techniques, they will take you a long way toward developing a 510(k) submission that will be among the 25 percent that are accepted by FDA upon first submission, first time out of the box. That would be a great place to start. For more on the 510(k) process, substantial equivalence, split predicates, and more check out Dr. Drues’ upcoming online course The Premarket Notification/510(k) Submission: Using Substantial Equivalence to your Advantage, which will take place on November 5, 2014, at 1:00 pm. It will go into further detail on these and other topics, using actual medical device case studies to illustrate important concepts.